Leading and trailing spaces in Excel often leads to a lot of frustration. I can’t think of a situation where you may need these extra spaces, but it often finds its way into the excel spreadsheets. There are many ways you can end up with these extra spaces – for example, as a part of the data download from a database, while copying data from a text document, or entered manually by mistake. Leading, trailing, or double space between text could lead to a lot of serious issues. 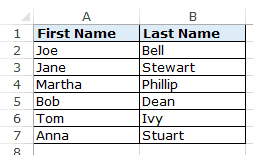 Now have a look at what happens when I use a VLOOKUP function to get the last name using the first name. You might not be able to spot the difference with the naked eye that there is an extra trailing space in the name that is causing this error. In this example, it was easy to spot the issue in such a small data set, but imagine having to check this for thousands of records. To be on the safe side, it is always a good idea to clean your data and remove spaces in Excel. In this tutorial, I will show you two ways to remove spaces in Excel. Excel TRIM function removes the leading and trailing spaces, and double spaces between text strings. Excel TRIM function would instantly remove all the leading and trailing spaces in the cell. Once you have the cleaned data, copy it paste it as values in place of the original data. This function is also helpful if you have more than one space character between words. It would remove the extra spaces such that the result always have one space character between words. Excel TRIM function does a good job in removing spaces in Excel, however, it fails when you have non-printing characters (such as line breaks) in your data set. To remove non-printing characters, you can use a combination of TRIM and CLEAN functions. 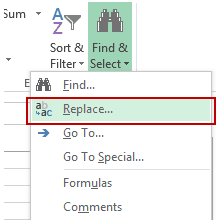 You can remove spaces in Excel using the Find and Replace functionality. When you want to remove double spaces. When you want to remove all the space characters. Note that this technique cannot be used to remove leading or trailing spaces. It will find and replace double spaces irrespective of its position. Select the cells from which you want to remove double spaces. Go to Home –> Find & Select –> Replace. (You can also use the keyboard shortcut – Control + H). This will replace all the double spaces with a single space character. Note that this will only remove double spaces. If you have three space characters in between 2 words, it would result in 2 space characters (would remove one). In such cases, you can do this again to remove and any double spaces that might have been left. Select the cells from which you want to remove the space character. This will remove all the space characters in the selected data set. Note that in this case, even if there are more than one space characters between two text strings or numbers, all of it would be removed. You can also use Find and Replace to quickly remove line breaks. Replace With: Leave it empty. This will instantly remove all the line breaks from the data set that you selected. Based on your situation, you can choose either method (formula or find and replace) to remove spaces in Excel. 10 Super Neat Ways to Clean Data in Excel. MS Help – Remove Space and Non-printing characters. I want to control space (line space, in the old days-“leading”) between two lines of type within a cell. Is it possible and how to do it? Hi Sumit, thank you for your post, quick observation bro, forgive me if I have misunderstood the image. I noticed in you *.gif explanation of VLOOKUP not being able to find “Bob”, due to the leading space. The reason he is getting an error is because there is a _trailing_ space after “Bob” in A5, but not in D2.